A disabled journalism student involved in a row over shorthand has thanked supporters after his case caused an exam board to change its policy. 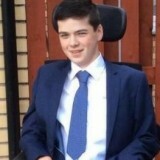 HTFP revealed last week that the Scottish Qualification Authority is set to offer two separate qualifications in journalism after previously telling 19-year-old Kyle Gunn, who has cerebral palsy, he would not receive higher national diploma in practical journalism because he is unable to complete the shorthand section of the course. After reviewing its policy following Kyle’s case being brought into the public eye, and following consultation with the National Council for the Training of Journalists, the SQA will now allow students to choose whether to take shorthand when studying HND courses. After Kyle’s story was initially broken by weekly newspaper The Gazette – which covers Johnstone, Renfrew and other areas to the west of Glasgow – Harry Potter author JK Rowling and Scottish Conservative party leader Ruth Davidson shared his plight on Twitter to millions of followers. Speaking to The Gazette, Glasgow Clyde College student Kyle said: “My first day at college was good and I am just getting to know everyone. “Shorthand is obviously something I can’t do, so I’m very happy that they have changed it to allow me to hopefully get the qualification at the end. The new qualifications will be available from next spring, but arrangements will be made for people on the existing course to be transferred onto the new framework if shorthand is not appropriate for them.